On 20 April, 1897, De Kerniea James Thomas Hiett (1854-1930), an inveterate calculator designer of St. Louis, obtained his first patent for calculating machine (US580863)—a multi column keyboard adding and printing calculator. Hiett will obtain quite a few patents for calculating devices, typewriter, tabulating mechanism, and sealing device. 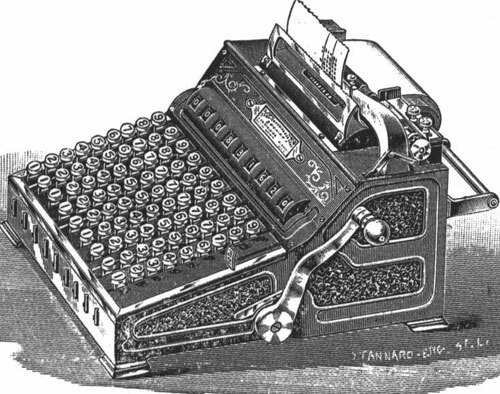 In 1890s he worked together with another inventor of typewriting and calculating machines, William Quentell, and one of his patents for typewriter (US547146 from 1895) was assigned to Quentell. Hiett's calculating machine later was advertised as Hiett Adding and Listing Machine in late 1890s and as Universal Adding Machine since 1900 and was put in production by Universal Accountant Machine Co., St. Louis. An electric motor attachment was introduced in 1903 (patent US731857 of Penrose Chapman). The Universal Adding Machine Co. was acquired by Burroughs Adding Machine Co. in 1908 and operated as a division of Burroughs until 1910. · The novel construction of the operating-lever in combination with the racks, the keyboard, and the adding mechanism, whereby when the racks are in position said lever will throw the adding mechanism into engagement with the racks and move the racks so as to actuate the adding mechanism while said adding mechanism is in engagement, said lever only releasing the adding mechanism and permitting its disengagement from the racks after the racks have completed their movement.